Page To ScreenIn Page To Screen, we compare a movie to the book that spawned it. The analysis goes into deep detail about specific plot points—in other words, you’ve been warned. The movie Victor Frankenstein opens with the line “You know the story.” But do you? Mary Shelley’s novel has been adapted so many times that the real story, the novel published in 1818, feels like it’s become almost as much of a myth as its monster. The popular book was made into a theater production in 1823, and the first Frankenstein film was made in 1910. Since then, dozens of film, TV, and theater adaptations have been produced, giving viewers who have never read the original book warped and re-written versions; even Kenneth Branagh’s misleadingly titled Mary Shelley’s Frankenstein, which begins as a fairly “straight” adaptation, ends up straying far from its original plot. Victor Frankenstein, starring Daniel Radcliffe and James McAvoy, deviates so significantly from the original telling it should have been titled Igor Strausman. Radcliffe’s Igor narrates the first line of Victor Frankenstein—but there is no Igor in the book. Instead, the novel opens with a series of letters written by the explorer Robert Walton, who is searching for a sea passage through the Arctic. One day he sees a mysterious sight: “a being which had the shape of a man, but apparently of gigantic stature” driving a dog sled across the ice. The next day another man is found: our hero, Victor Frankenstein, who is in pursuit of the other man. His limbs were in proportion, and I had selected his features as beautiful. Beautiful!—Great God! His yellow skin scarcely covered the work of muscles and arteries beneath; his hair was of a lustrous black and flowing; his teeth of a pearly whiteness; but these luxuriances only formed a more horrid contrast with his watery eyes, that seemed almost of the same color as the dun white sockets in which they were set, his shriveled complexion and straight black lips. Frankenstein flees in horror, and when he returns to his laboratory, the creature is gone. When Igor helps Victor animate his first creature—an animal hybrid named Gordon—Victor promotes him to partner, but he never treats Igor as an equal. When Igor starts to doubt him, Victor turns on him with vehemence: “You’re a fool. I created you. You think you can turn your back on me… walk out into the world? Fine. I’m done with you.” In the film, Victor abandons Igor—not his creature. But in the book, the rejected creature escapes out into the world and receives quite an education. Later on the creature confronts Frankenstein: “Remember, that I am thy creature; I ought to be thy Adam; but I am rather the fallen angel, whom thou drivest from joy for no misdeed.” This lofty speech is a far cry from the grunts and “errrrs” we’re used to hearing Frankenstein’s monster make. This creature articulates his need for companionship: He wants a mate. Frankenstein reluctantly agrees. Prometheus, as he is called, turns out to be physically similar to Shelley’s creature: gigantic in stature and hideous to behold. But his real monstrosity lies in his empty, lifeless gaze. “This is not life,” Victor mourns. He is crushed—and then starts the lengthy process of killing what he has created. Igor turns up, and together they undo what they have done. Then Victor, somehow having escaped responsibility for the debacle he leaves behind, sets off alone, writing a farewell letter to Igor, which neatly keeps the door open for a sequel. But the end of Shelley’s novel is far more finite. Frankenstein cannot go through with his promise to make the creature a mate, and now the enraged creature has nothing to live for. In revenge, and to make Frankenstein as lonely as himself, the creature kills Frankenstein’s best friend, and then kills Elizabeth on their wedding night. Frankenstein spends the rest of his life in pursuit of the creature, his eternal enemy. He sprung from the cabin-window, as he said this, upon the ice-raft which lay close to the vessel. He was soon borne away by the waves, and lost in darkness and distance. This most recent movie adaptation adds a lot of characters that don’t appear in the original. There is of course Igor, who takes away from Frankenstein’s isolated egotism. It adds Lorelei, who could have replaced Elizabeth, but who is Igor’s love interest instead. It adds the aristocrat Finnegan who wants Victor’s life-making “technology,” but we never find out what he plans to do with it. And it adds an inspector—Roderick Turpin—who represents faith to Victor’s science and adds the only voice of intelligent caution in the whole film: “You play with wrathful forces,” he warns Victor. The film adds an overlay of anatomical images that show the way Igor and Victor look at bodies—the beautiful Lorelei or the repellent Gordon—similar to the way Sherlock shows the detective’s thinking in words and numbers visible on screen. Also reminiscent of Sherlock is the repartee between characters, especially during the scene where Igor moves in and Frankenstein, like Sherlock to Watson, rattles off what is where and then promptly disappears, leaving Igor to fend for himself. Perhaps not surprisingly, the film’s director, Paul McGuigan, also directed several episodes of Sherlock, and the actor who plays Inspector Turpin is Andrew Scott, who played Sherlock’s Moriarty. The film also has an awareness of other adaptations, often undercutting them with humor. When Victor famously cries out, “It’s alive!” and Igor stammers, “Do you realize how significant this is?” this newest Victor waits a beat and responds with a knowing “Oh, I have an inkling.” And when Lorelei first meets Victor and pronounces his last name “Frahnk-en-schteen” (á la Gene Wilder from Young Frankenstein) he corrects her flatly, his voice cracking with impatience: “It’s Frankenstein.” Otherwise the film plays fast and loose with the original—mixing up names and roles and references, trusting that these choices will invoke a general mood and not require anyone to think too hard about the rationales behind them. 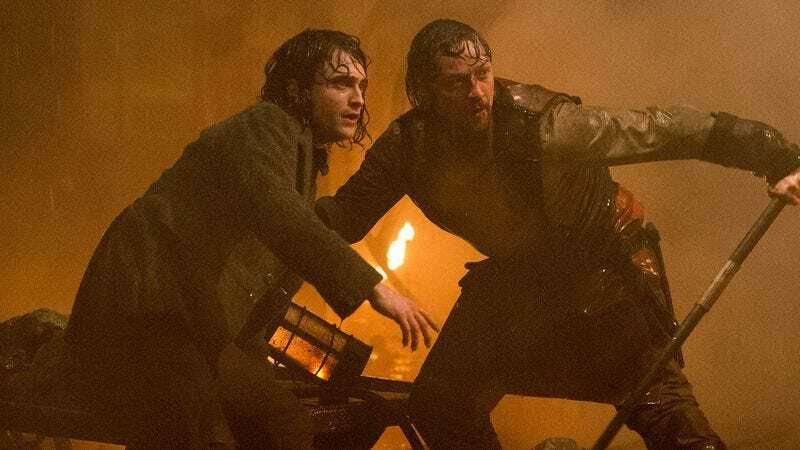 Start with: Victor Frankenstein serves as two hours’ entertainment—especially if you enjoy McAvoy and Radcliffe’s antics. But as an adaptation of Mary Shelley’s Frankenstein? We’re still waiting for a film to do it justice. Start with the original, and then Nick Dear’s play of the same name, and then try to see it performed via the National Theatre Live production starring Benedict Cumberbatch and Jonny Lee Miller alternating the roles of Frankenstein and the creature. But within a few years a new adaptation will emerge. No matter how we reshape the original story, something will come along to shock it back to life.